Get ready to raid the kitchen for this one or think about draping fabric to represent the carcass if you wan't to keep things fresh! 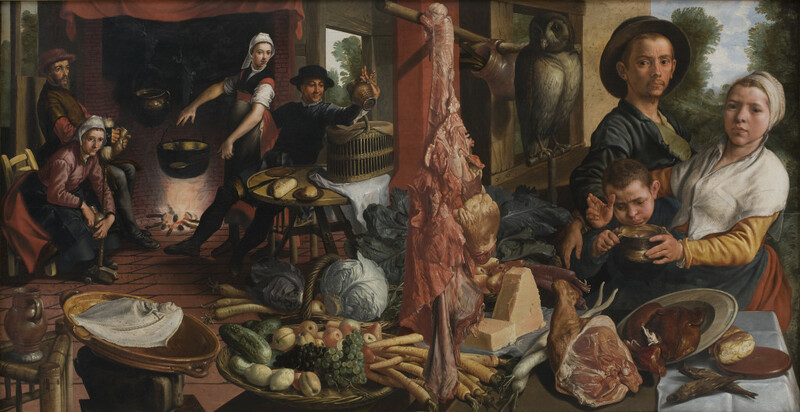 Pieter Aertsen (1508–1575), called Lange Pier (“Tall Pete”) because of his height, was a Dutch painter who invented the style of combining still life and genre painting, very often also including a biblical scene in the background. He was born and died in Amsterdam but mainly lived in Antwerp, then the centre of artistic life in the Netherlands. His peasant scenes preceded the much better-known paintings produced by Pieter Bruegel the Elder. The plucked carcass in the centre of the piece divides the scene of excess to the left from the restrained figures on the right. The table is groaning under its load of meat, fish, bread, and fresh vegetables but the peasant couple behind the table check their son’s consumption while they look upon us with a degree of suspicion. The father has turned his back on what is going on in the left half of the picture. A young man is in high spirits, raising his jug of ale as he puts his arm around the young woman while an older couple clutch theirs and stare into space with a melancholy air. The painting is a warning against “voluptas carnis”; a life in the throes of the senses, leading to gluttony, drunkenness, and moral looseness. Still life was a necessary alternative to religious painting. During the early years of his career, Aertsen created a number of altarpieces that he, to his great wrath and sorrow, saw destroyed during the iconoclastic riots of the Reformation.